The Gowanus Lounge: Here's "Coney Island Park"
The big-bucks developer who bought Coney Island's oldest amusement park plans to replace it with a glitzy $250 million playground anchored by a roller coaster that dips under the Boardwalk, the Daily News has learned. Double the size of Astroland, the multitiered park will include 21 rides, a hotel, a manmade canal for boat rides, a glass-encased atrium and commercial space. "We're trying to deliver on the promise of what Coney Island is," said Chris Durmick, creative director of Thinkwell Design & Production, the California group that is drawing up the 6-acre plan. "Whatever you come looking for at Coney Island, it's all going to be there." Astroland owner Carol Hill Albert, whose family had owned the gritty but storied park since 1962, sold the site to developer Thor Equities in November for an unspecified amount. Coney Island Park, slated to open in 2011, would be one component of a 13-acre, $1.5 billion plan by Thor that includes an indoor water park and residential, retail and entertainment components. The flagship ride is the "Leviathan," a 100-foot-tall coaster with loop-de-loops that dips under the Boardwalk before flying back aboveground. Including the Cyclone and another coaster planned for Stillwell Ave., it would be the third for the area. Another marquee ride, the Aviator, would soar 120 feet, with gondolas guided individually by hand-held joysticks. 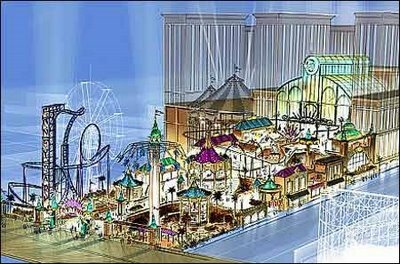 Kinetic Carnival, the Coney Island blog, comments that "Attention will now be on ThinkWell as we eagerly await and see what specific plans they will conjure up. With this new report Thor seems to have gained many points to their side. Let's hope Thor and company keep the promise and integrity of the importance of the amusements in Coney." We have questioned Thor's plans for Coney, and still have concerns about its plans to build massive highrises with luxury condos in the amusement area, but the plan for the Astroland property certainly looks like a step in the right direction, assuming it is serious.